An economical, user-friendly choice for offices, classrooms and events, Sunon Furniture's modern designed training table offers lightweight yet durable solutions to workspace, dining and seating needs. 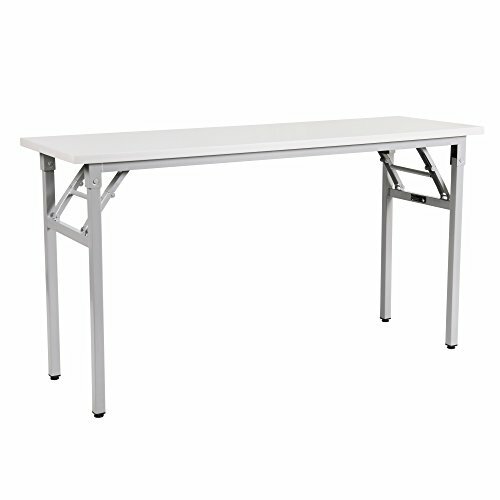 This multi-function desk features a heavy-duty top crafted of waterproof, impact-resistant resin and a white powder-coated steel frame with double side support rails for added stability. Cleaning is easy, and the table weighs just 46 lbs so it can be set up and taken down by one person. Ideal for indoor or outdoor use. Product Dimensions: L55" * W 17.7" * H 29.5"
• Multi-function: This desk can be used as computer desk, writing desk, office table, training table, dining table, meeting table, exhibition table, etc. • Computer desk dimension: L55" * W 17.7" * H 29.5", provides ample desktop space for computer, monitor or printer etc. • Firm Materials: High Pressure melamine top, waterproof, stain proof, scratch-resistant and impact-resistant. • High Stability: This contemporary computer/desk offers a sleek modern design crafted with high pressure melamine and heavy-duty powder-coated metal frame. • GREENGUARD Indoor Air Quality certified to reduce harsh chemicals. If you have any questions about this product by Sunon, contact us by completing and submitting the form below. If you are looking for a specif part number, please include it with your message.